Instead of wasting time sorting clothes into loads on laundry day, sort as you go with multiple hampers. This will take away that extra step on laundry day. 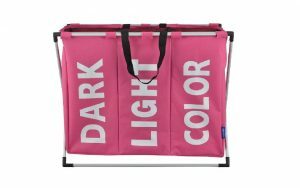 It also allows you to customize your loads of laundry however you prefer. If you like to wash each family member’s laundry separately, set your hampers up and label them with each person’s name. 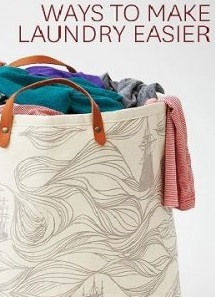 If you prefer to wash loads by color or texture, label each hamper that way. On laundry day, take each hamper one at a time to the laundry room and simply transfer all the clothes from the hamper to the washer. No sorting necessary! 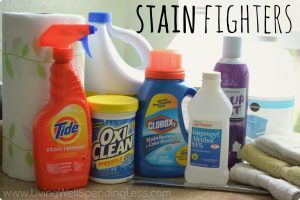 Just like sorting laundry, stain treatment on laundry day can take a ton of time (especially if you have kids). The time and energy it takes to look at each piece of clothing from the hamper, one-by-one, is time consuming. Instead, treat them as you go by keeping some of your favorite stain treatment near the hamper. Examining one outfit before it goes into the hamper is much more manageable. How does this help move things along? Separate items that need to be air-dried into their own zippered bag, so you don’t have to waste time sorting them out between the washer and dryer. This also eliminates time spent hand washing certain items or separating them into an additional “delicate” cycle load simply by washing them right along with a normal load of clothes. The mesh bag will protect most items from everything else and cushion them during the spin cycle. To make this work best, buy zippered mesh bags with a “hidden” zipper that stays shut firmly during the wash cycle. You can put multiple items inside one mesh bag. Just be sure not to overfill so that soap and water can move freely into the bag and reach each garment. 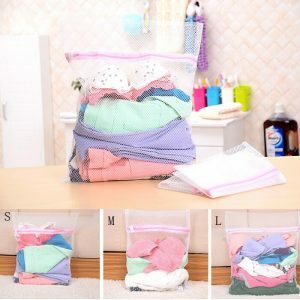 Mesh bags can also help you cut down on the number of loads you wash. Obviously, fewer loads = less time and hassle, plus, studies show that a full load is cleaned more effectively and efficiently than a load with just a few items. Just be sure you don’t over stuff the washer or dryer. 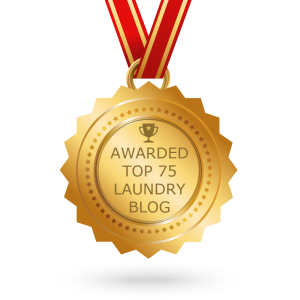 A good rule of thumb is to fill the machine until it’s ¾ full so that the items can get equal attention from your detergent and rinse thoroughly.